Over this past weekend, I was apparently summoned in a Facebook thread; someone was contemplating the elemental arrangement of the geomantic figures, such that the topmost line is given to Fire, the next one down to Air, the next one after that to Water, and the bottommost line to Earth. Given such an arrangement, they were interested in seeing how the elements given in such an order could overlap with the elements given to particular energy centers in the body (the resource they were using was some neopagan/Wiccan-derivative text that involves another rehash of the seven Vedic-system chakras with a novel Western elemental approach). There are obvious issues in straightforwardly trying to map the elemental rows of the geomantic figures to a system of chakrasa, not least because they’re different systems with different bases of logic, but also because Western occult systems haven’t historically had a notion of “chakras” or bodily energy systems before the advent of Theosophy and the influx of “Oriental” traditions. This isn’t to say that there are no energy practices in Western occulture historically, but nothing like what we’d commonly think of as having discrete energy centers or “chakras” in the body connected by meridians. …the system of how the elements are arranged as rows within a geomantic figure is based on their elemental density as well as their natural motion: Fire is the most subtle and burns outwards and upwards, Air is slightly more dense than Fire and moves sideways, Water is even more dense than Air and moves downward, and Earth is densest of all and compresses and condenses unto itself into a stable, unmoving form. This order (Fire, Air, Water, Earth) is different than that used in the Zodiac (Fire, Earth, Air, Water) due to a different logic, however, due to a different logic of how these two systems are built (I don’t have my notes on the latter zodiacal order at the moment and forget that system’s particular logic here). In this sense, we can see a sort of match between the metaphorical “geomantic” body parts and the elements of the rows they correspond to: the head with Fire due to the intelligent Divine Spark given to us as well as with sight and perceiving light or Light, the throat or arms with Air as means of communication and breathing, the belly with Water due to it being the seat of health and the humours of the body, and the legs or feet with Earth because they are what support us on the Earth. Such a system doesn’t match with one based on chakras, however, because there wasn’t historically a “chakra system” of the West, though there are other types and notions of energetic or subtle bodies (though not necessarily in those terms). Using Agrippa’s Scale of Four, for instance, we can consider a multipart “human” composed of Mind, Spirit, Soul, and Body, which are given to the elements of Fire, Air, Water, and Earth, respectively, each with the faculties of Knowing, Thinking, Emotion, and Physicality, but these are more like interconnecting “layers” (think of the Egyptian notion of the multipart soul, with the physical body, spiritual body, identity, personality, shadow, heart, double, intelligence, power, and so forth). Perhaps, if you were to shoehorn a variant of chakra systems onto the geomantic “body”, you could reinterpret it so that the third eye or crown chakra was given to Fire (giving it Will or Divinity) and the throat to Air. Such a “geomantic energy center” system could work, and might be useful to experiment with: the Fire center in the head, the Air center in the hollow of the throat, the Water center in the belly, and the Earth center either in the feet or at the perineum (where the legs meet the rest of the body). Could be interesting to experiment with! However, it’s important to note that these associations may be limited in scope. Case brings this list up in a discussion of queries related to house I, which is also the house that should be inspected to make sure the chart is authenticated: not necessarily valid, but useful and accurate as well as valid. Specifically, Case says that “the Figure [chart] is verified also by certain moles, marks, or scars”, with the figure in house I indicating the part of the body where the mark may be found. It’s important to note that the parts of the body are associated with the figures by means of their zodiacal correspondences, though it’s not made explicit in the list above; thus, because Case gives Populus to Capricorn (using the traditional associations of the figures to the Zodiac that I also use), and because Populus rules over the knees (and also bones, skin, etc. ), Populus gets all the body associations that Capricorn has. Having projected your Figure, consider the Figure in the first House and the Idea and Ruler that governs it, and what part of member in mans body they govern: for the Querent hath a Mole, Mark or Scar in that part of his body. Example: if Puer be in the first House, it is a cut in the head or face, or burn, or red Mole: If Coniunctio, it is on the belly, viz. a Mole, Mark or Scar: if Puella be in the first, it is on the Reins, viz. a Mark, &c. If Rubeus, the Secrets. Consider if the first Figure go into any other House out of the first, the Querent hath a Mole in that part also: Consider Populus, and wheresoever she is, that House and Figure tells you in what part the Querent hath another. What Figure is in the sixth House, notes usually a Mark, Mole, or Scar in the Member it signifieth, as you may read in the 26 Chapter of the first book: if Carcer or Tristitia signifie the Mar, &c. it is generally an excrescence of a dark obscure or black colour. If Acquisitio or Lætitia, it is usually a purple or blewish Mole: If Puer or Rubeus, it is commonly some Scar, Slash or Cut, chiefly in a House governed by a fiery Idea [i.e. ruled over by a fire sign]; and sometimes a reddish Mole or spots of Gunpowder: If Fortuna Major, or Fortuna Minor, generally of an olive or chestnut colour: if Amissio or Puella, of a hony-color. If Albus or Conjunctio, whitish or lead-color: if Populus or Via, white, and of the color the Figures signifie that behold them: Caput Draconis, white; Cauda Draconis, black or read: If the figure be Masculine that represents the Mole, Mark, &c. it is on the right side of the Body; if Feminine, judge the contrary. If the Significator of the Mole, &c. be in the first, seventh, eighth, ninth, tenth, eleventh and twelfth of any question; it is then visible to the eye, and other forepart of the Body: but the other Houses signifie the Mole is to to be seen, but it is on the back-part of the Body. If ill Figures be in the first, the Querent is usually blemished: for the Face is signified by the first, let what figure soever be in it. Note that, in general, the table Heydon gives above is related mostly to specific inquiries about house VI, while the figures themselves as described here typically are simply given the usual zodiacal correspondence to the body. Heydon, I should note, uses the planetary-zodiacal associations common to later geomancers and which is in use by the Golden Dawn and John Michael Greer and not the older system that I and other geomancers historically used. Heydon’s information above, however, is useful in determining not just the specific location of marks on the body, but also their type and coloration, too, which is information not otherwise commonly seen in the geomantic literature available to us. So much for the scant Western resources we have on associating the geomantic figures with the parts of the body: the rule appears to be to link the figures to the parts of the body by means of their shared zodiacal correspondences. I can’t recall there being other sets of explicit associations of the figures with the body in Fludd, Pietro d’Abano, or other European authors, though I don’t doubt they exist; however, I do doubt that they’d do much more than retranslate existing sets of correspondences that exist for parts of the body using their shared zodiacal or planetary associations. Stephen Skinner in his Geomancy in Theory and Practice gives a translation of these, but some of them are incorrect; he says that “the figure…faces outwards from the page, so left and right have been designated from the point of view of the figure rather than the manuscript page”, so he gives e.g. Puer to the left shoulder, although Puer in the diagram is clearly designated as “al-kutuf al-ayman”, or right shoulder. I retranslated from the diagram in the manuscript as best I could. The only figure in the list that was truly mysterious was Via, which was not given a label; Albus is designated as “belly”, so I interpreted that as the upper belly and stomach, and Via as the lower belly and intestines, though it could also refer to the back and spine (which, physically speaking, would resemble the shape of Via). Similarly, I couldn’t make out what word is given to Populus, but given the symmetry here, I’m assuming it’s referring to the right side of the torso in general, though there is a chance that it refers to the inner viscera of the upper torso and Coniunctio refers to the outer flesh and the ribcage on both sides of the torso in general. However, I can’t be certain as yet; those who can read this kind of older, book-script Arabic are welcome to comment. EDIT: Thanks to a few people from the Geomantic Study-Group on Facebook, I’ve amended some of the translations further. Populus is given to the back and Coniunctio to the ribs. Via, though unlabeled, can be interpreted as the navel, which still ties into the lower belly and intestines. There still is some ambiguity in the diagram, but this is still far better off than we were before. My thanks go out to Masood and B.A.! Personally, I like the layout of the “Geomantic Adam” design above and how the figures are clearly arranged on the body, though I also like the use of planetary and zodiacal associations. I suppose a blended approach could work: use the geomantic arrangement for general body areas, and the organs and physical systems associated with the planets and elements to fill in the gaps. So, for instance, since Laetitia rules the head in the Arabic design, one could say that Laetitia would also rule over the brain; however, since Mercury rules over the nervous system as a whole, this could be given to Albus or Coniunctio, and given Albus’ location closer to the solar plexus, I’d wager that Albus could rule both the belly as a general physical area as well as the nervous system. Further clarification on expanding the Arabic system would be good, I’d think, in one sense or another. Anyway, back to the diagram. Even with the parts of the body that are clearly labeled, we can see something fascinating: the figures with only one element active are associated clearly with the parts of the body that we’d call those corresponding elemental rows: Laetitia, with only the Fire/Head line active, is given to the head; Rubeus, with only the Air/Throat line active, is given to the throat; Albus, with only the Water/Belly line active, is given to the belly; and Tristitia, with only the Earth/Feet line active, is given to the privates and groin, which is the lowest part of the torso to which the feet and legs are connected. 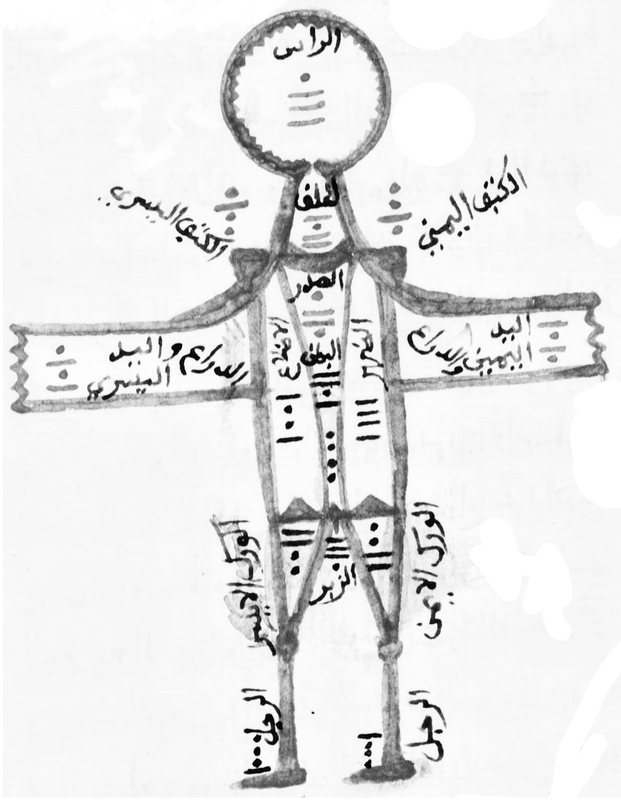 Though the manuscript dates only to the 18th century, it’s likely that it has much earlier origins or carries on an older Arabic tradition of geomancy from whence the body-names of the rows of the figures comes. This, along with a clear use of geomantic relationships between parts of the body that match each other (right hand and left hand, right shoulder and left shoulder, etc.) is greatly indicative that the body-correspondences given in MS Arabe 2631 are strictly geomantic in nature rather than using planetary or zodiacal go-betweens. The Fire Center would be found in the head, likely just under the crown of the skull directly above the top of the spinal column. The Air Center would be found in the throat, in the middle of the neck though perhaps slightly closer to the spine than the front. The Water Center would be found in the belly, closer to the stomach just under the ribcage near the solar plexus. The Earth Center would be found in the groin, near the perineum at the base of the spine. Of course, this is all highly hypothetical and experimental stuff we’re getting into, but then, that’s never stopped me before. I would venture to say that this sort of geomantic energy center work could easily and happily be paired with my system of geomantic gestures or “mudras”, such that when working with the Fire Center in the head, one would make the gesture for Laetitia while intoning bi or bē or nar. With enough experimentation, I suppose a full (or at least fuller) system of energy work with a geomantic subtle body could be developed for other magical work, or used instead of Vedic- or Chinese-based systems that are commonly found in later Hermetic or Western magical systems. This is definitely something I want to (slowly) explore, but if you’re interested and willing to give it a shot, why not try experimenting with this system as a base for your own work? If you do, I’d love to hear what you’d think of such a practice!